N. S. International is enthusiastically affianced in catering the specific need of various industrial sectors. The company is primirally engaged in the manufacturing & exporting various industrial & automotive fasteners like standard fasteners,non-standard fasteners,turned components & CNC machined components made out of Alloy Steel,Stainless Steel ,Brass and other materials.In addition to this the company has acquired loads of accolades in the national as well as international market for serving flawless quality products and prompt services. We also possess ISO 9001:2000 Certification that reflects the authenticity of the products and our credibility. Quality and excellence form the thrust of our esteemed organization. With our perseverance and competence, we have set high standards in the market. We also aspire to provide complete satisfaction to customers concerned with sectors like Construction, Chemical, Pharmaceutical, Petrochemical, Fertilizers, Electrical, Automobile, Machine & Machine Tool Manufacturers, Mining, Defence, Telecom and Railways. 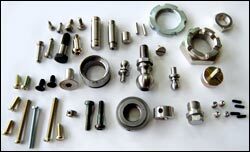 We are reckoned as one of the most outstanding Turned Machine Components Manufacturers from India.